HYPER-REALITY | THE WIZARDING WORLD OF HARRY POTTER. Harry Potter has become somewhat of a household name in the last decade; with seven books, eight movies, four theme parks and one studio experience in London, the Harry Potter franchise has identified itself to be a global brand with a loyal following. Fans of the books/saga almost belong to a world that is both fictional and real at the same time. 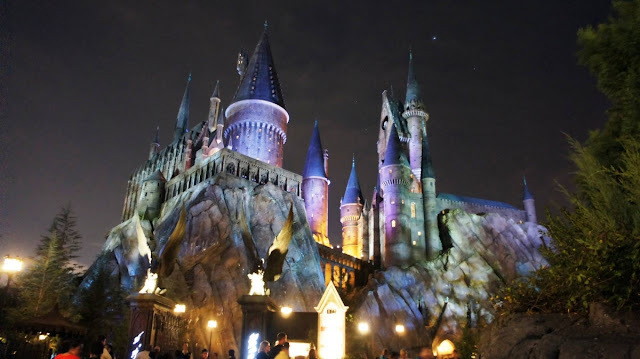 The Wizarding World of Harry Potter, located in Universal Studios has allowed fans to be transported to a completely different universe in the form of Hogwarts, through the realm of hyper-reality. In 1986, Eco defined hyperreality as being the condition where the ‘completely real’ became identified with the ‘completely fake’. The trend with hyper-reality is to provide 'hyperworlds' where the commingling of what is virtual and what is perceived as real is not obvious and thus appear to be natural (Tiffin, 2001). This is exactly what The Wizarding World of Harry Potter (TWWOHP) had achieved when the park was open in 2007. So how well does the Harry Potter theme park grasp the sense of hyper-reality and most importantly, do these form of events 'work'? The notable authors who explored the essence of hyperreality are Baudrillard (1983) and Eco (1987). Eco understood the term as being culturally specific situations where the copy comes first, whereas Jean Baudrillard explained the term as being copies without originals, where both representation and reality have been displaced by simulacra. Baudrillard regards hyperreality as a detachment from reality and not a mirror image. Stolze (2016) has slightly different views and believed it is more accurate to say that “the material world has not disappeared but has remained effective, however much it has become increasingly mediated by technology” (2016, p. 95) Many critics have discussed the way in which contemporary culture uses simulations, hyperreality, and false appearances. One of which being Boorstin (1987) who claimed America is living in an age of contrivance in which fabricated things have become dominant in society. Some authors have pointed out that Boostin was very good at identifying what was unreal in modern society but not the fake. Eco was particularly critical of theme parks such as Disneyland and believed that hyperreality leads us to believe that technology can give us more reality than nature can. Academic visitors of these theme parks have had lengthy discussions on them and have found much to analyse. Theme parks such as Disney and Universal have been criticised for having a tendency to expose visitors with ‘hyperreal’ messages and meanings (Eco, 1998). Thanks to the development of the leisure and tourism industry, guests are never left alone with just their senses (Harris, 2005) and instead view theme parks through rose-tinted glasses. Bryman (1995) believed that with parks such as Disney, the lines between what is real and what is fake are blurred. This was also demonstrated by McGuigan (cited in Mayer, 2002) who noted how the Disney universe is put on a pedestal for being the epitome of hyperreality, where representation itself has become more real than the reality of the places they try to depict. In one of his more recent journals, Baudrillard (2001) further discussed hyperreality and the impact fantasy worlds have on society and stated that they are all copies in which no original ever existed. It begs the question; since society has been exposed to these hyperreal, imaginary and wonderful worlds, will we ever be content with reality and is there any room for anything else? HOW DOES THE WIZARDING WORLD OF HARRY POTTER DO THIS? Looking at the theme parks specifically, the above can be said of Disney World and Disney Land because it takes towns and ‘natural’ wonders and turn them into an altered reality. Adventureland is filled with ‘alligators’ on the banks, but when travelling to Mississippi you may not be greeted with the same scenery (Woolley, 1993) and thus might lead to disappointed. 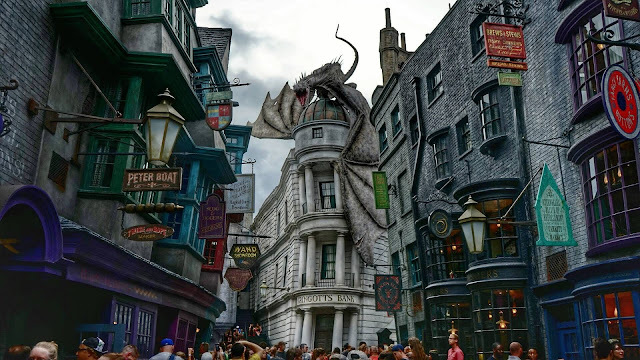 When comparing this to Universal Studios and particularly The Wizarding World of Harry Potter (WWOHP), guests know they are entering a world that is completely created for guests to escape reality. They do this with their themed rides, ‘the three broomsticks’ restaurant which serves the famous butterbeer, and an array of shops in Diagon Alley and Hogsmeade. Here guests can find all their Quidditch needs with broomsticks, cloaks, house banners and snitches, or head to Ollivanders to find their unique wand, or take home some bertie botts every flavour beans. 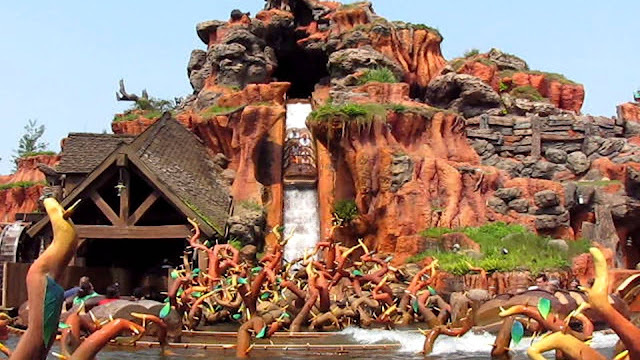 Watson (cited in Mayer, 2002) suggested that the construction of impossible or unnatural landscapes which allow visitors to escape the real world is a distinct feature of the parks and part of their appeal to guests. Lee (2015) found that there is a growing interest for tourists to visit places that do not exist apart from in the realm of ‘secondary worlds’ such as Narnia, Hobbiton and Tatooine. Whilst the Lord Of The Rings sets can be experienced where it was filmed (New Zealand), places like Hogwarts and Diagon Alley have been fabricated in order to satisfy this need for tourists who have a strong fan affiliation to the movies and books. In her journal Lee also pointed out that the experience offered in Harry Potter Tours in UK are very different to that of TWWOHP in Orlando, Florida. She believed the latter represents what Eco (1986 ) described as being a ‘furious hyperreality’ where authenticity is visual as opposed to historical. The difference therefore being that Harry Potter Tours contain real filming locations that formed part of the movies, whereas TWWOHP is all based on fictional, man-made buildings, characters and props. When Harry Potter World was first opened in 2007, 8.3 million attended Universal Studios, compared with 7.1 million the previous year (Orlando Senitel 2017). Keeping that figure in mind, surely combining hyperreality with these forms of events are effective. Disney has plans in store to open a Avatar themed park in 2017 in Animal Kingdom, in addition to a Star Wars themed land in its park in Anaheim, California (Bloomberg 2017). The 2009 movie Avatar is the highest grossing movie of all time, and with Harry Potter being equally as popular, is it the case that fans of the series attend these events/parks simply because of their affiliation to it? Or does the sense of hyperreality and escapism draw them in? It is clear TWWOHP has been highly successful and succeeds in bringing Harry Potter fans one step closer to Hogwarts and the realm the movies exist in. Having visited the theme park myself, I definitely felt a sense of escapism and unlike some of the other parks in Universal’s Island of Adventure i.e. Seuss Landing, Jurassic Park. TWWOHP leaves you feeling completely immersed in it. 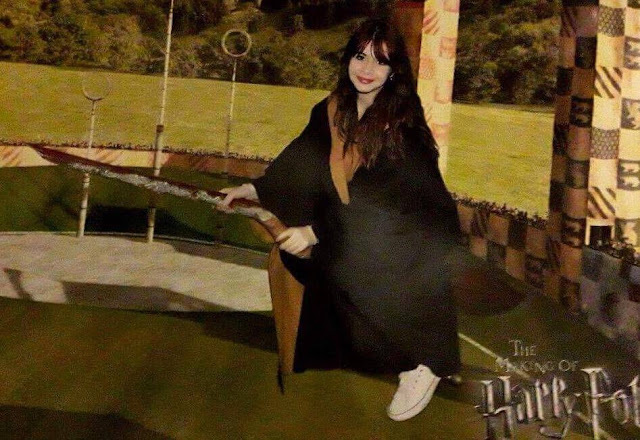 I myself don’t consider myself to be a fanatic of the series, however the hyperreality aspect gives you a sense that you’re flying through the Quidditch pitch on the Harry Potter and The Forbidden Journey Ride, or actually casting spells when using your interactive wand throughout Hogsmeade and Diagon Alley (Universal Orlando 2017). I believe that the hyperreality itself is what makes the park so popular, paired with the thrill of the rides it leaves guests feeling happy, excited and slightly nauseous. Perhaps if TWWOHP were solely memorabilia and sets they wouldn’t receive the amount of footfall they do, and would be targeted more towards fans. Instead TWWOHP caters for all age groups and mega fans, Floridians and tourists alike. This blog post has aimed to discuss and demonstrate how hyperreality is integrated in theme parks, particularly in The Wizarding World of Harry Potter and more importantly if it is an effective tool. The events industry is gearing more towards new technology and hyperreality in forms of virtual reality, holograms and even robotics. There is still a lack of research discussing hyperreality in events and what the future holds; the work of Baudrillard, Eco and Boostin is still largely discussed today especially in terms of hyperreality in everyday life. When looking at events such as product launches, concerts and music festivals, hyperreality is something that could enhance the experience instead of hindering it. Whereas with events such as weddings and more personal celebrations, it might take away the traditional essence of them and may not be as successful. The danger of hyperreality is that people may strive for a reality that isn’t real (Merkhofer, 2007). If an event can be transformed or altered to provide a more unique and memorable experience, then using hyperreality, simulacra or creating a spectacle is beneficial. This is what event managers are tasked with and should consider for future events as the world of events and technology moves forward. What are your thoughts on theme parks such as Disney and Universal - are you a fan of hyperreality or prefer what is real? Love the picture of you on the broomstick!